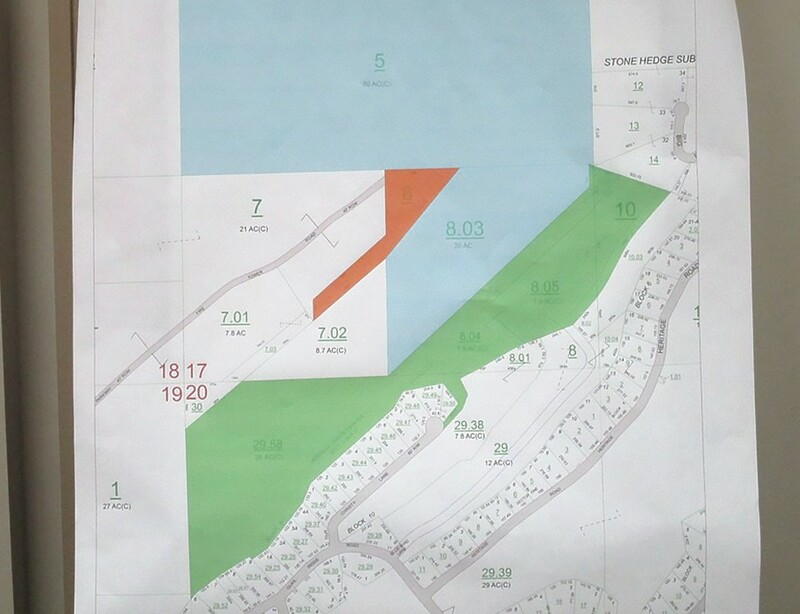 Map of Palisades Park following donation of 45.3 acres (shown in green) of property by the Auth Family Trust in memory of Drs. Ira B. and Darlene F. Patton to the Blount County Commission. The property connects the rock bluff at Palisades to the Heritage Golf property at the base of the ridge. Shown in blue is the pre-existing Palisades Park property, consisting of 100 acres. The orange-colored tract is 3 acres +/- leased from the Alabama Forestry Commission where the Sand Mountain Fire Tower is located. Approximate size of the park is now almost 150 acres. In a contentious 35-minute interlude, including a summons to courthouse security to restore order in the commission boardroom, the Blount County Commission passed a motion to allow citizens to choose in a referendum between the existing district system and the proposed unit system forms of county government organization. The first hour of the meeting and the last 45 minutes were handled in basically routine fashion. The motion was to formally request that the local Blount County legislative delegation pass legislation in the 2019 legislative session authorizing the referendum to be held in the 2020 general election, with the changeover to be implemented on Jan. 1, 2025, should the unit system prevail. The motion passed by a vote of 3-1. Voting yes were District 2 Commissioner Mike Painter, District 3 Commissioner Dean Calvert, and District 4 Commissioner Nick Washburn. District 1 Commissioner Allen Armstrong voted no, after his effort to amend the original motion failed from want of a second. The amendment would have attached a 10-mill property tax to the result of any referendum on the unit system, based on the argument that, without more money, the unit system would not improve road maintenance results over the district system. In concept, the unit system would centralize the road maintenance and improvement function of county government into a single unit or organization under the direction of the county engineer and a road maintenance superintendent. All equipment and road crew employees would also be centralized under their direction, instead of divided into four separate districts, each under the supervision of a county commissioner, as under the current form of organization. A second major feature of the unit system proposed for Blount County would split the functions of probate judge and commission chairman – now combined into one job – into two separate jobs by creating a full-time elected commission chairperson. • a motion to request local legislation in the 2019 session of the Alabama Legislature that would impose a four percent lodging tax in Blount County to apply to rented rooms in hotels, motels, inns, tourist camps or cabins, bed and breakfast homes, or other such accommodations. The revenue from the tax would be used to support county tourism for such things as county beautification projects, county park and recreation projects, and maintaining the county covered bridges as a predominant tourist attraction. • a motion to request local legislation that would give the Blount County commission authority to clean up, demolish, or remove abandoned and unsafe buildings or structures when they are unsafe, or a danger to public health, or when they are found by the county commission to be a public nuisance. The act would provide due process for individuals wishing to contest commission decisions, and would provide a mechanism for assessing the cost of removal in the form of a lien on the property where the structure is located. It would authorize the Blount County Revenue Commissioner to collect such assessments. The commission voted 2-2 on the motion to request the legislation, with Calvert and Painter voting in favor and Armstrong and Washburn voting against. Commission chairman broke the tie with a vote in favor, and the motion carried. • a motion to request local legislation for veterans who receive an honorable discharge to receive a free pistol permit, a benefit favored by Sheriff Mark Moon. The motion passed unanimously. Due to time/space constraints, the remainder of the Jan. 15 commission meeting report will appear next week.